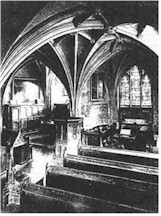 The church was not always limited to its present home in the Black Prince's Chantry in the Undercroft of Canterbury Cathedral. The space used varied with the volume of refugees and waned with their dispersal to other parish churches. Some of the earliest THEVELIN mentions (1597) and others later in 1715 are in the Walloon Church records. The church underwent a revival and refurbishment in 1875 while 40 years earlier it was struggling with a congregation of seventy at monthly services and was administered from London. If you happen to be in Canterbury on a Sunday afternoon at 3pm, you could join a small gathering of Huguenot devotees and have the moving experience of Evensong in French that will stay with you for the rest of your life. Louis THEVELIN and his three daughters, Marie, Jane and Susans were each married here between 1592 and 1606 when Susane remarried. Francois DE LA RUE, Louys widow, was remarried here in 1602. Two of Jacque OLIVE's sons were married in this church, at the turn of the 17th to 18th Century, but no record of other TEVELEIN marriages has been seen. Used extensively by the OLIVE family for many baptisms from 1672 to 1762 and for Isaac's children whose wife of course was Elizabeth OLIVE.